When you have a hot tub outdoors, having it enclosed in a gazebo will enhance the look and feel of your outdoor living space. There are many different designs of hot tub gazebos for you to consider so that the one you choose matches your location and the exterior of your home. One of the main factors to consider before making the purchase is that you choose materials that are able to withstand the weather conditions of your area. Your choice of material will also affect the overall design of the gazebo. Wood and aluminum are the most durable materials to choose in hot tub gazebos because both of these materials will stand up well in harsh weather conditions. If wood is your choice, you will need to make sure it is pressure treated wood so that it will be resistant to rot and the damage that insects can cause to the wood. The base of the gazebo must be very strong to withstand the weight of the hot tub when it is filled with water. 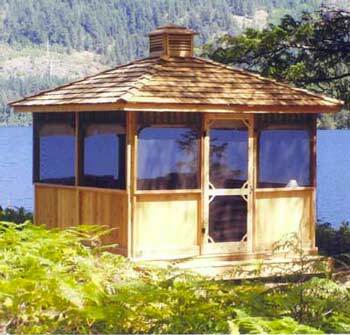 Many people concentrate on making sure that they do have a strong base in the gazebo but forget about the roof. The roof of hot tub gazebos also has to be sturdy so that high winds won’t damage it. For this reason, the roof section should be completely enclosed so that air cannot get in around it. If you have an open roof, it will become more susceptible to high winds, which can actually lift the top right off, ruining the gazebo and then you will have to start rebuilding. The shape and size of hot tub gazebos must suit the space you have available. This is a factor that you have to consider before you buy the hot tub. You must make sure that the tub fits in the location giving you plenty of room to move around outside the structure. Although you may desperately want to have gazebo-style hot tub enclosures in your backyard, you don’t want it to completely fill the yard. At the same time, you do want to have a gazebo and hot tub that can comfortable seat at least four people. When you browse the many designs of hot tub gazebos available and look at the prices, you should also consider the gazebo kits you can buy. A typical gazebo delivered and installed could cost you anywhere between $2000 and $5000 depending on the size and the materials. You can cut this cost in half by using a kit that will help you build the gazebo of your dreams on your own. Kits for hot tub gazebos are very easy to use because they are designed to make the assembly process simple for those with no carpentry experience. You will get everything you need for building the gazebo in the kit so that you do not have to buy anything extra from a hardware store or lumber yard. The materials are all pre-cut to the exact measurements and all you have to do is follow the detailed assembly instructions. Most of them are almost assembled when you receive the kit, which means very little work for you. Some of the models of hot tub gazebo kits will take as little as four or five hours to have them in place and ready for the hot tub installation.